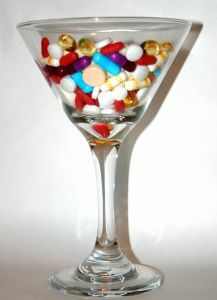 Medicinal Mixology: Cocktails Treat Symptoms. Doctor’s orders. These boozy drinks might just help you with that cough of yours. “We’re serving cocktails that allow the well-heeled crowd to ingest medicinal ingredients in ways they like,” says mixologist Neal Bodenheimer, co-owner of the aptly named Cure in New Orleans. A 2010 University of Texas study showed that one to two drinks a day could increase longevity, and infusing them with curative ingredients can improve immunity and alleviate many ailments, says Jim White, R.D., spokesperson for the Academy of Nutrition and Dietetics. Ready to retire the hot toddy? The Drink: Farmer’s Daughter from Teardrop Cocktail Lounge, Portland, Ore. The Cure: Goldenseal extract, which Native Americans used to treat digestive ailments and skin problems, has anti-inflammatory properties that may improve immunity and digestive function and help curb cold symptoms. Combine ingredients in a rocks glass over ice and stir for 30 seconds. Garnish with grapefruit zest.